The triangular wedge is made of plastic and is covered with gold foil slit in half at the wedge's tip. 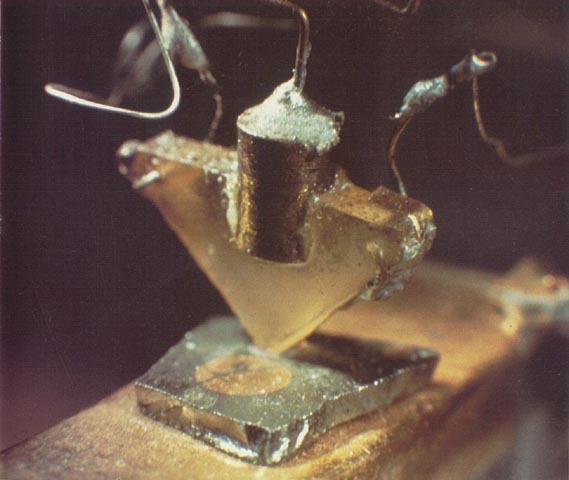 One side of the wedge serves as the emitter, the other as the collector. The irregular-shaped material directly under the wedge is germanium, which acts as the base. Gains in current of up to a hundredfold may be attained with this device. (A re-creation.) Actual size: the wedge is 1.25 inches to a side.